Things may not end well for The Musketeers. In a recent interview with Digital Spy, the BBC series’ executive producers said fans can expect a dark final season. Earlier, we reported that all three seasons of the UK drama are available in the U.S. on Hulu as of May 14th. The action series stars Luke Pasqualino, Tom Burke, Santiago Cabrera, and Howard Charles as D’Artagnan, Athos, Aramis, and Porthos from Alexandre Dumas’ novel The Three Musketeers. 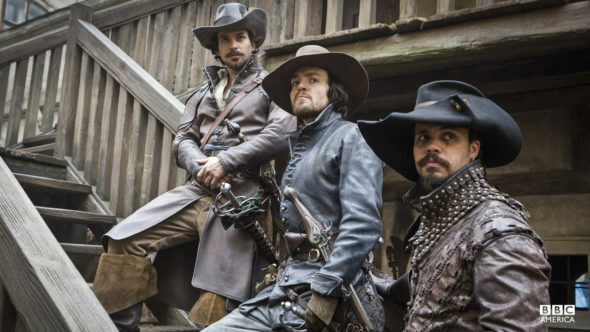 The third and final season of The Musketeers begins on BBC One on May 28th at 9:30 p.m. ET/PT. What do you think? Are you a fan of The Musketeers? What do you hope happens in the last season? More about: BBC TV shows: canceled or renewed?, Hulu TV shows: canceled or renewed?, The Musketeers, The Musketeers: canceled or renewed? Why is everything ending that is so nice? I just love The Musketeers and really would like to see a fourth season! My hart is ripped into peaces . I just started to watch season 3. Will this be shown on BBC America?